When I lived in Parma, Italy, I ate a ton of pasta. At first, I did not notice how much of the delicious starch I was ingesting. The wheels of the 757 skidded to a stop at the Florence airport and the walk off the plane was the first of many long walks through the streets. Wearing fancy sandals, the soles hit the pavement from one corner of the Renaissance city to the other. As such, I was convinced that in the early days of Parma, I was shedding the pounds. Clearly, walking between 5-10 miles a day meant that I had earned a pot of pasta for dinner, no? The irony of this situation is that until my body adjusted and became comfortable with this walking, I was losing weight and eating pasta for every meal. Unfortunately, after about month of adjusting to this decadent lifestyle, those miles each day were just part of the normal routine and the pasta eating caught up with me. Yet, even as my pants got tighter from the pasta, desserts, and countless cappuccinos, I never regretted a one! You cannot live in Italy and not enjoy the food; it would have been sinful!! Guiseppe was my italian "boyfriend." I met him one night while having drinks with some friends on Strada Farini. Being fairly poor college kids, we would cruise the bars for the "aperitivo" hour. Bars between 6-7PM would put out delicious finger foods for anyone who purchased a cocktail. Paying for the glass of wine, we would stay for the "free tapas" as we called it. That was were I met Guiseppe. He practiced his English with me and I butchered Italian with him. We hung out most evenings after our initial encounter and he would cook dinner while I sat back and sipped red wine from his region of Italy. It was romantic and silly. He was a tremendous cook and laughed at my American grilled cheese sandwiches calling them an abomination. I gobbled them down anyway when I was nostalgic for home. 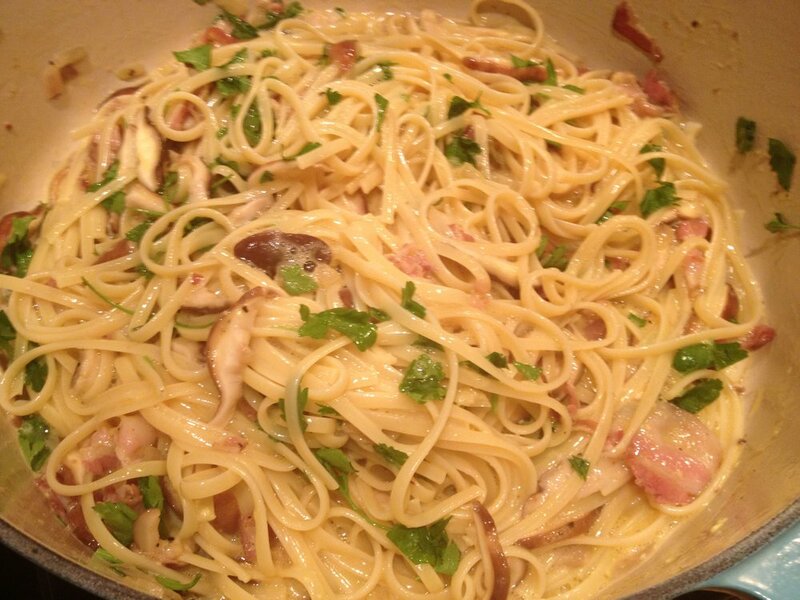 My favorite recipe of his was a take on the classic pasta carbonara. I say his "take on it" because he usually tossed in anything that he had in his pantry and it was always delicious. Who knows where Guiseppe is these days....but at least his pasta can still warm my belly on a cold night in Boston, haha! Boil and strain the pasta. 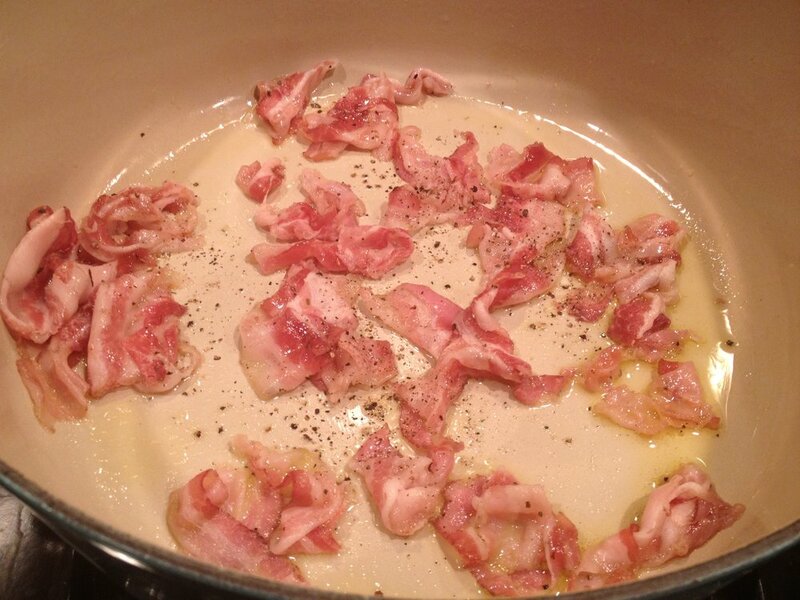 In a pan deep enough to hold the pasta when combined at the end, saute pancetta in 3 tablespoons of olive oil. Add pepper and salt. 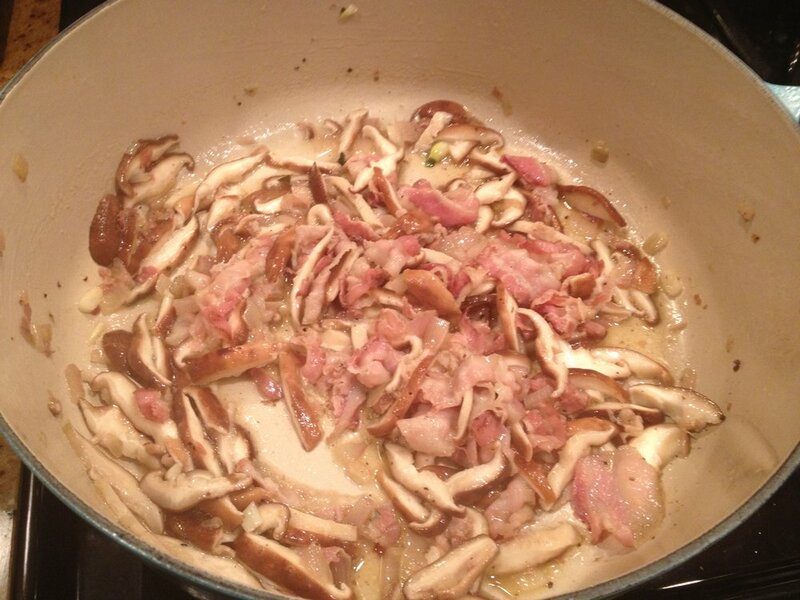 Toss in 3-5 cloves of garlic diced and one shallot diced. 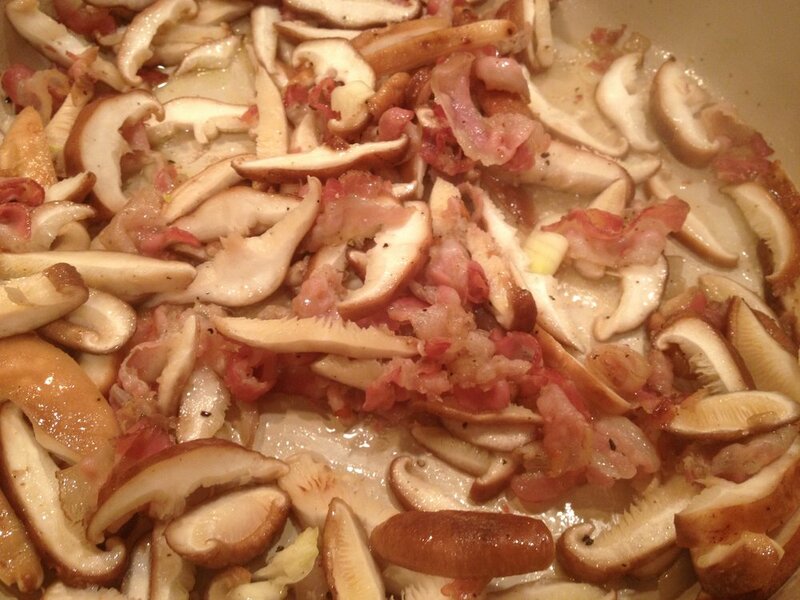 Saute until pancetta is slightly browned and garlic and shallots become fragrant. 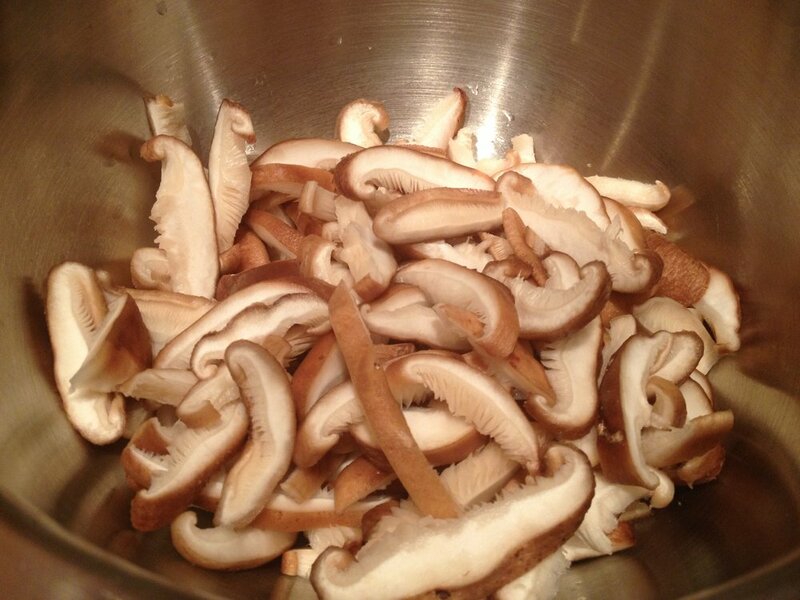 Toss in the Shitake mushrooms sliced and saute until they reduce in size about half. 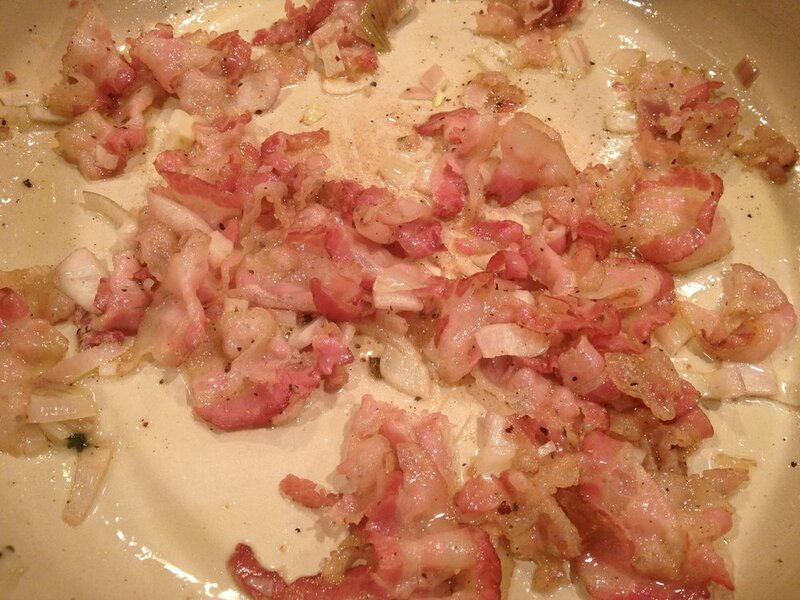 Reduce heat of the pan to low, add the cooked pasta and mix well so that the mixture is evenly tossed. 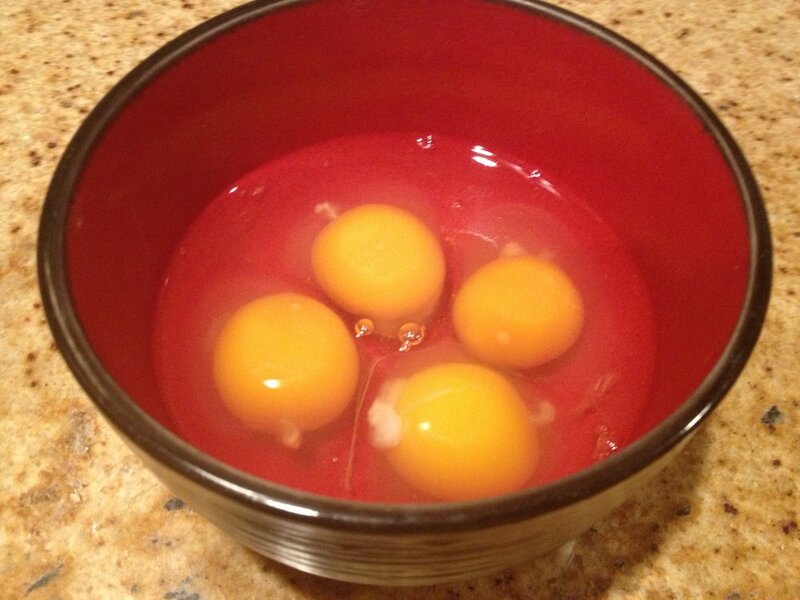 Beat four eggs in a side bowl and fold into the pasta mixture. Mix all of the ingredients well, making sure the eggs do not scramble. Turn off heat, toss in a heaping handful of cheese and a 1/4 cup, or so, of parsley. Serve immediately.